The LionSteel Opera lock back knife with damascus steel drop point blade, genuine stag handle scales and fileworked backspring is a combination of old world craftsmanship and modern engineering. High quality components like beautiful damascus steel and genuine stag are meticulously crafted into a stunning high end EDC knife. 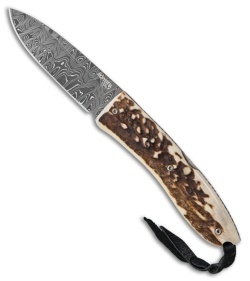 The swirling damascus and stag patterns make each knife a one-of-a-kind. The lock back spring with intricate filework creates another visual touch while securely locking the blade open. Store your Opera in the included Cedar storage block to keep it in pristine condition when not in use.